Hi, my dear reader! Do you know, what is the difference between anxiety and stress? Some time ago I wrote an article on this topic, and today I represent the second part of my first post. There is a difference between anxiety and stress, and we all need to understand it if we want to reduce stress and anxiety. There is a difference between them, however, it’s not always clearly seen and felt. Stress is caused by a factor called stressor. But anxiety continues after stressor is gone and sometimes felt for a long period. Remember, what causes one person to be stressed out not necessary mean stress for another. One of stress negative effects is anxiety. Stress is your body’s reaction to something that upsets your normal balance in life. It is your response when you feel threatened. Anxiety is a feeling of unease when you are worrying about something like an exam. When you are facing something difficult, it’s normal and even positive to feel anxious. Interestingly, sources of information look at stress and anxiety differently which sometimes can be confusing. Even if the stressor is gone, anxiety holds one and keeps interfering with your life. For example, anxiety can be related to work stresses and this person has insomnia. But then this person got a new job, and he was happy and free of anxiety. Right? Oh, no, he still wasn’t able to sleep and was worrying about something else than usually. He couldn’t get free of anxiety. Anxiety is stress that continues after the stressor is gone (U.S. National Library of Medicine). Remember that a panic attack isn’t the state of feeling very panicked. According to the Anxiety and Depression Association of America, it is a very specific experience that involves sweating, pounding heartbeat, trembling, chest pains and nausea. Usually, a panic attack begins suddenly, and many people go to the emergency room when they experience it, because it feels like a heart attack. If you want to read more about ways to understand the difference between anxiety and stress, check this article that I wrote some time ago. If you experience anxiety or stress, you need to talk to someone you trust and love, and I am sure you will feel better afterward. There are also a lot of stress relief tips that can help you. Now you understand a little more about the difference between stress and anxiety. How often do you experience stress and anxiety? Do you feel the difference? What do you use to let go of stress and anxiety? Let me know below! I would be happy if you would tell me about your experiences. 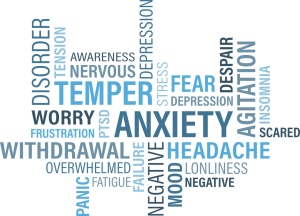 If you want to know more about the difference between stress and anxiety, CLICK HERE to read about it. If you are interested in finding out how to relieve stress naturally, please subscribe to this blog, and you will receive notifications of my upcoming articles. If you think this article is helpful, let your friends know by sharing it on social media. Thank you, my friend! I hope you have a great day and stress and anxiety don’t bother you.